Inspired by the idea of making a contemporary sledge with ecologic materials. 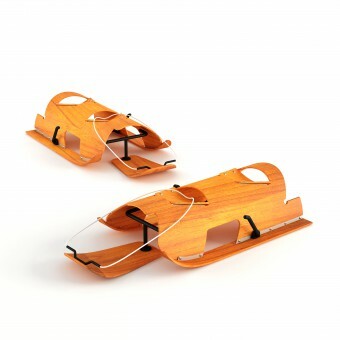 It was important not to lose the riding style of old-school sledges while designing a contemporary one. Slegger is a snow sledge for two. Its body is designed to distribute the weight of the skiers equally to the slides. The seats on board are cut from the body and assembled reverse to board. 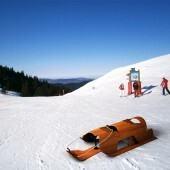 Slegger can be used by one or two skiers. The skier in the front controls steering by holding the rein. 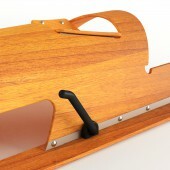 Feet of front skier are placed on steering board to ease holding the rein. The skier at the back controls breaking sticks which are placed at both sides of the sledge. These sticks are used to not only make the sledge slow down but also support steering by using them one-sided. In addition, the rein is used to pull the sledge while climbing to top of track. 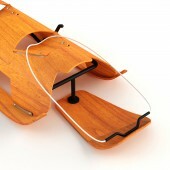 The material of the body, slides and steering board are plywood and they are shaped by bending. Connection parts are stainless steel. Nowadays most of the snow sledges are made of plastic materials and these sledges are not fully qualified to reflect the soul of sledging. Making the sledge from ecologic materials bring it through inartificial and conventional structure. In addition, use of plywood and stainless steel allows to give a contemporary form to sledge. Main challenge was optimizing the diameter of the body. The diameter of the body is important in terms of the height of the seat, space between feet and implementation of proposed bending technique. Levent Muslular and Kiraz Sema Turhan, 2016. 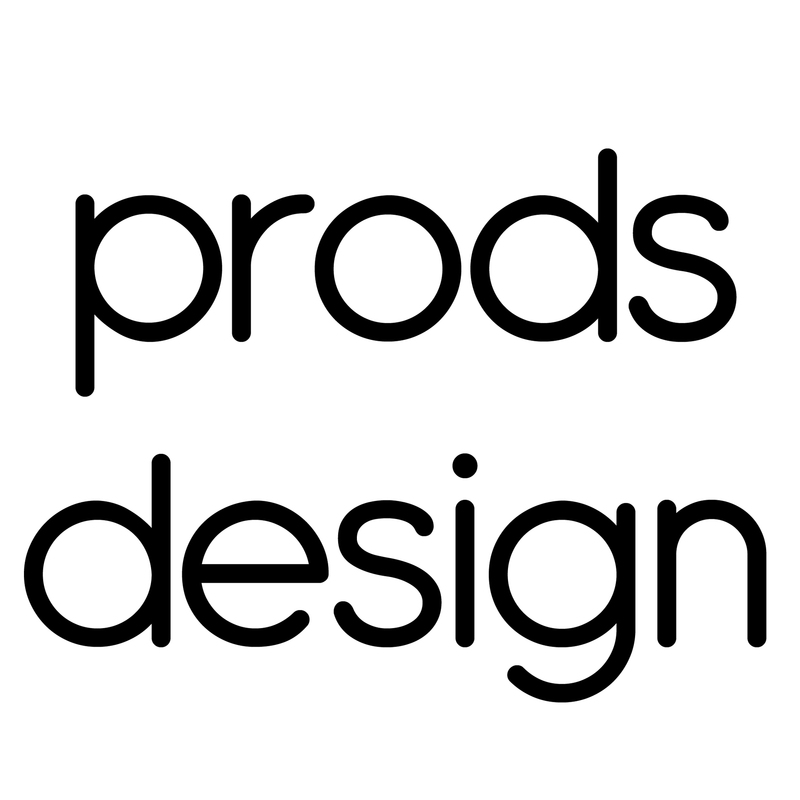 Prods Design is a product design studio which is founded in 2016. We are working on projects from various sectors. Besides of design services, we are providing design engineering and production services. Working with the principle of getting involved of all stage of the product development provides us a great perspective to consulting our clients. Slegger Snow Sledge Snow Sledge by Levent Muslular and Kiraz Sema Turhan is a Nominee in Sports, Entertainment and Recreation Equipment Design Category. · Click here to register today inorder to be able to view the profile and other works by Levent Muslular and Kiraz Sema Turhan when results are announced. Slegger Snow Sledge Snow Sledge by Levent Muslular and Kiraz Sema Turhan is Winner in Sports, Entertainment and Recreation Equipment Design Category, 2016 - 2017. · Press Members: Login or Register to request an exclusive interview with Levent Muslular and Kiraz Sema Turhan. · Click here to register inorder to view the profile and other works by Levent Muslular and Kiraz Sema Turhan. Did you like Levent Muslular and Kiraz Sema Turhan's Sports Equipment Design? 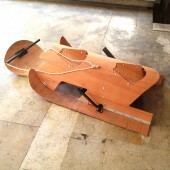 Did you like Slegger Snow Sledge Snow Sledge? Help us create a global awareness for good sports equipment design worldwide. Show your support for Levent Muslular and Kiraz Sema Turhan, the creator of great sports equipment design by gifting them a nomination ticket so that we could promote more of their great sports equipment designs.